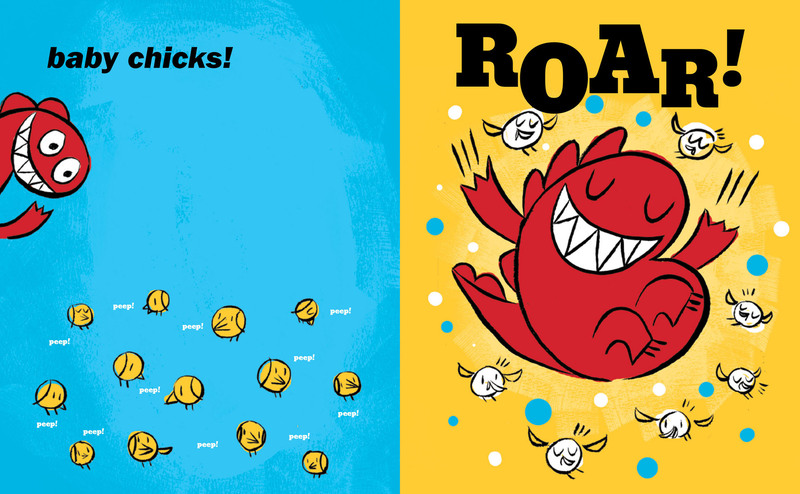 This morning over at Kirkus, I shine the spotlight on Steven Withrow’s worthy new venture, Poetry Advocates for Children & Young Adults, or PACYA. My Q&A with Withrow about PACYA is here, and next week I’ll have a bit more with Steven, too (here at 7-Imp). 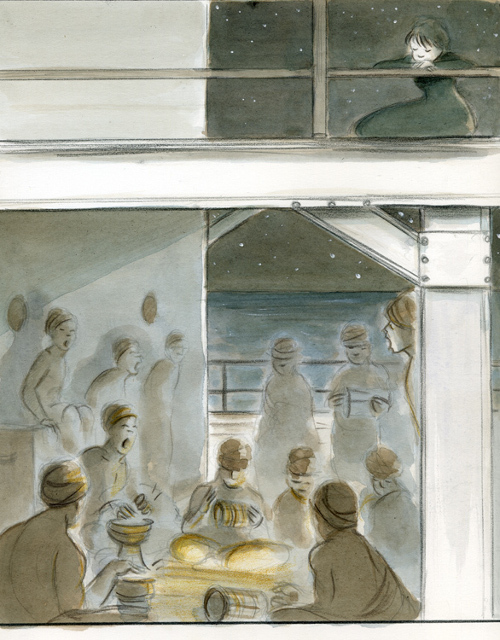 In last week’s column, I wrote about Susan Campbell Bartoletti’s beautiful new picture book, Naamah and the Ark at Night (pictured above), an August Candlewick release, illustrated with watercolor collages by Holly Meade. Here are some spreads below, followed by spreads from another of Holly’s titles this year (April 2011, also from Candlewick), one she both wrote and illustrated, called If I Never Forever Endeavor. The latter title, as Holly explained in her 2009 visit to 7-Imp, is “a story about a small bird and his internal dabate over whether to attempt that first flight from his safe nest — or not.” Those collage illustrations were rendered in watercolors and linoleum block printing. Enjoy the art . . . 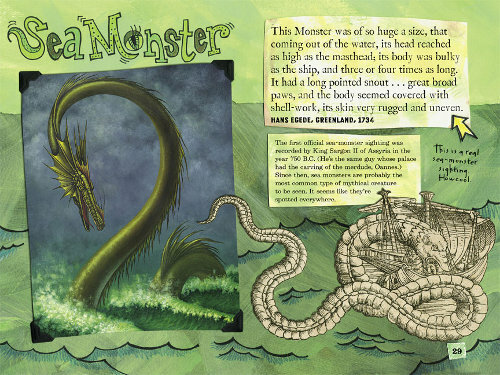 I had the pleasure in early September of talking via phone with author/illustrator Brian Selznick about his latest title, Wonderstruck (Scholastic, September 2011), as well as a bit about the 2008 Caldecott winner The Invention of Hugo Cabret (Scholastic, 2007); his hybrid style, if you will, of picture book, novel, and graphic novel; and the upcoming film adaptation of The Invention of Hugo Cabret, titled simply Hugo, by Martin Scorsese. 7-Imp readers know that my interviews, particularly with illustrators, tend to consist of the same set of questions I send to everyone — and interviews I can conduct via email, too. If, in Bizarro World, 7-Imp’ing were a full-time venture, everyone would get questions customized specifically to them, but having a standard set of questions for all the folks with whom I conduct Q&As is the only way I can find time to post any interviews at all, since blogging comes after things like children and work. However, with Selznick I had the opportunity to do a phone interview right at the release of Wonderstruck and didn’t want to pass it up. But it took a while to post, since after the interview’s completion, I had to find a transcriber to make it so that I could post it online for my readers. Finally, nearly two months later, here it is. In a former professional life, I was a sign language interpreter. My Bachelor’s degree is actually in that very subject, and I spent years studying American Sign Language and Deaf Studies and worked in the field for a good while in East Tennessee. For that reason, several of the questions below—and a good deal of my conversation with Brian—is about his research into Wonderstruck and the deafness aspect of the novel, which I wrote about over in a September Kirkus column. That link is here. Also, I should quickly note two things: First, my landline phone, during our conversation, decided it’d had enough of me, and when I called Brian back on my cell, he and his editor ever-so kindly recorded the latter part of the conversation on their end. This meant that my final questions and comments were not recorded, but as you can see below, I was able to piece together what I had asked him. Secondly, the transcriber did edit out things like “um”s—my own and Brian’s—but we generally left intact the casual, conversational tone that was this phone interview. That “I” up there is for “impossible” in my world today, because I think that it’s altogether impossible that “abecedarianship” is a word, but who knows. 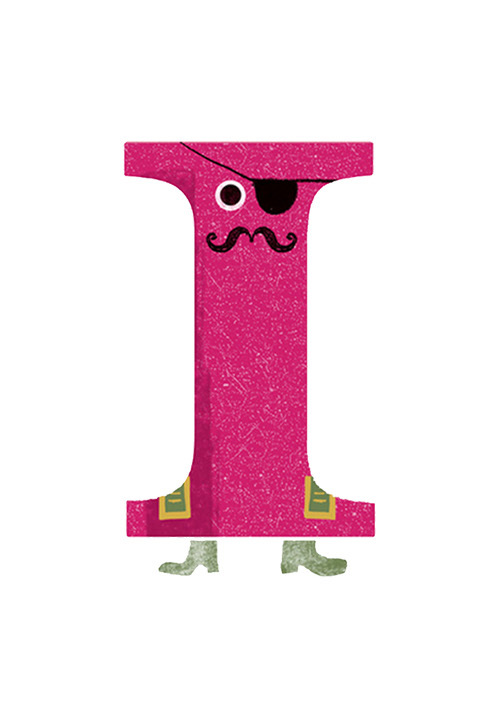 Yep, I’ve got two alphabet books before breakfast, a quickie post filled with lots of art — and both books with retro-tastic illustrations. I was jonesin’ for some retro art today, and … well, here we go. Paul Thurlby and Luciano Lozano are our guys this morning. Pictured at the very top of the post is the letter “I” from the hard-working Ministry of Letters. (For the record, his favorite words are “Itchy,” “Ice cream,” and “Icicles,” and his favorite musical instrument is the Irish Harp.) 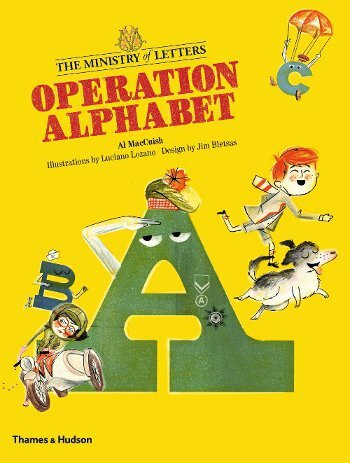 The Ministry of Letters is featured in Al MacCuish’s Operation Alphabet (published by Thames & Hudson), illustrated by Luciano Lozano and designed by Jim Bletsas. Lazona is a freelance illustrator, based in Barcelona. 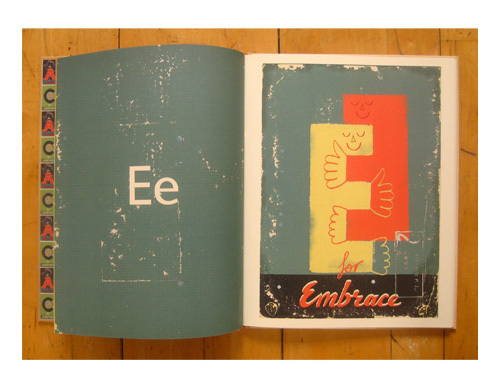 Jim Bletsas—how much do I love that the designer is listed on the front page of this picture book?—is a designer living in London. MacCuish is a Creative Director at a creative agency in London and also makes his home there. 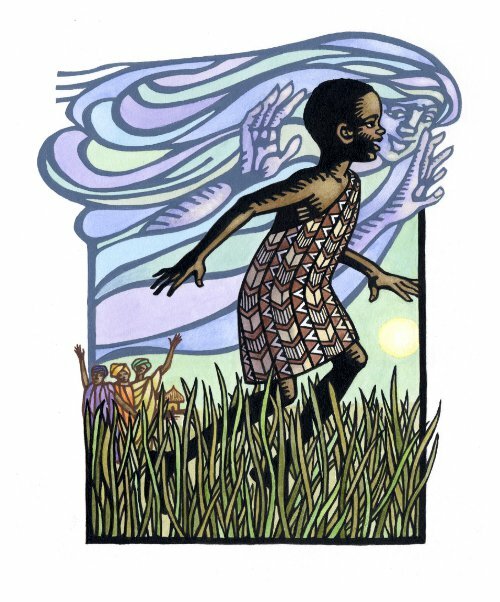 How do you introduce illustrators like Leo and Diane Dillon? Well, they’re not here visiting today (I wish), but how, I wonder, do I introduce their art without sounding like a blithering starstruck halfwit? Their work is simply stunning and quite often breathtaking and always beautiful. They are living legends, who have illustrated more than sixty books for children and are two-time Caldecott Medal winners. If you’re a fan, as I clearly am, you’ll want to see a copy of their latest illustrated title, written by the great Patricia C. McKissack, who herself has also acquired a slew of impressive awards in her career, including a Newbery Honor and a Coretta Scott King Award. It’s called Never Forgotten, was released by Schwartz & Wade this month, and has been met with starred reviews all-around. 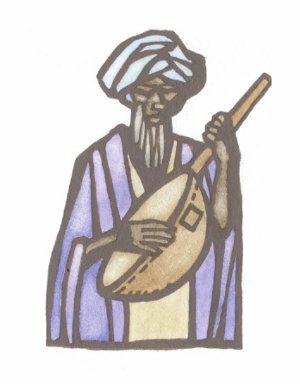 This morning over at Kirkus, I write about Susan Campbell Bartoletti’s Naamah and the Ark at Night, with illustrations from Holly Meade. The link is here. 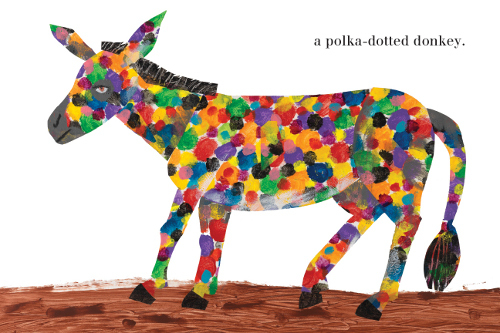 In last week’s column, I wrote about Eric Carle’s newest picture book, The Artist Who Painted a Blue Horse, released by Philomel this month. (Pictured above is one of the book’s best moments.) But since I start to get twitchy if I don’t show you some art from the picture books about which I write, this morning I share some spreads below. Enjoy. This is the spellbinding opening of Chapter 4 in author/illustrator Rosalyn Schanzer’s Witches! The Absolutely True Tale of Disaster in Salem, published by National Geographic Children’s Books in September of this year. 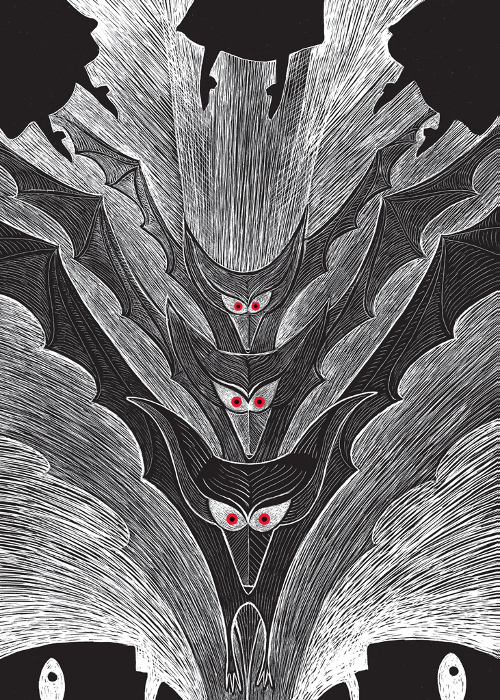 Two terrified men think they see a beast fly up into the air and turn into the spirits of three witches, while the three accused “witches” are in jail at the time. 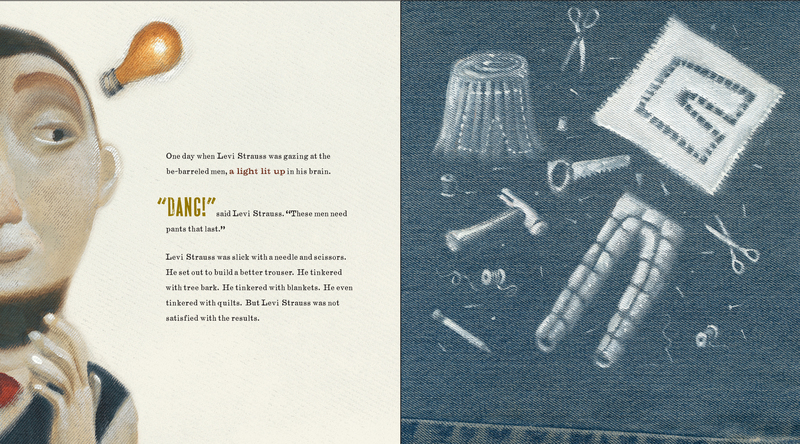 I can say with confidence that this is the first time here at 7-Imp that I’ve featured illustrations rendered on blue jeans. 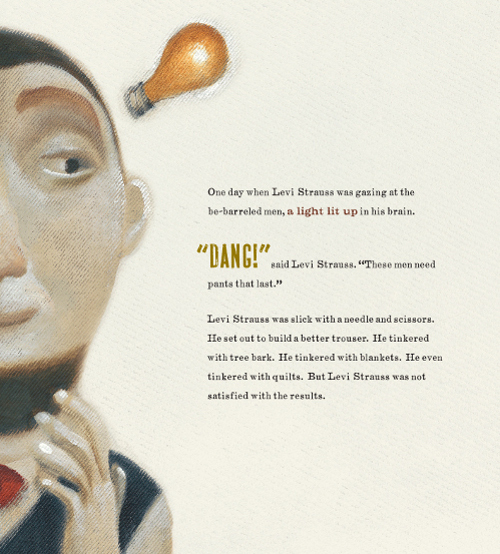 Yes, for Tony Johnston’s Levi Strauss Gets a Bright Idea: A Fairly Fabricated Story of a Pair of Pants (Houghton Mifflin Harcourt, September 2011), illustrator Stacy Innerst painted with acrylics on old blue jeans, and it totally works. This book, a barrel of fun (that’s a really bad pun that will make you cringe, once you go find yourself a copy), is—in the words of Johnston—“mostly legend with threads of truth, which my version stretches to near popping.” To be clear, there’s a closing author’s note that lays out the facts about Levi Strauss, but the narrative takes us on a tall-tale adventure, making this, incidentally, a great read-aloud to older elementary students. “GOLD!” somebody yelled. Next thing anybody knew, the whole world rushed to California and started digging up the place. The trouble was, they rushed so fast, they lost their pants. You know, I’m all the time here at 7-Imp having pretend breakfasts with authors and illustrators, when they’re really just cyber (the breakfasts, that is, not the people), but this morning I will have actual breakfast with the two author/illustrators featured here today. Or at least coffee. And I’m excited to meet them. 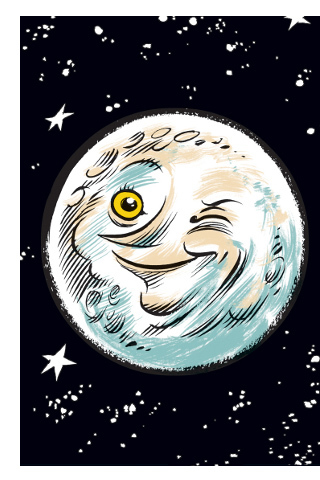 Here in Nashville this weekend, we are celebrating the Southern Festival of Books, and I will be hosting the session this afternoon for author/illustrators Matt Phelan and Bob Shea (and, as mentioned, get to meet up with them before-hand for a cup ‘o’ joe). 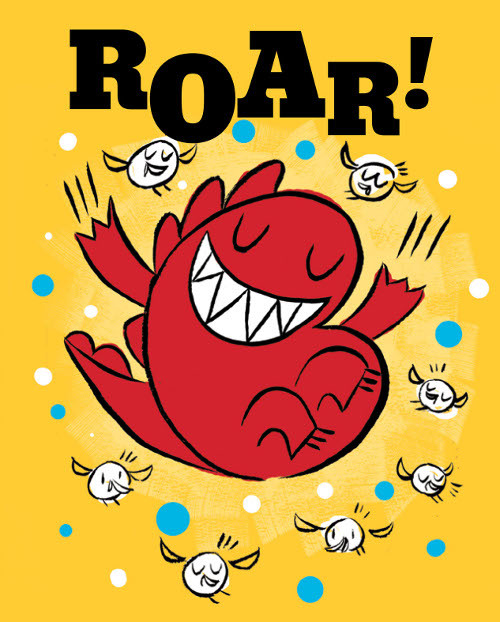 Opening this post is an image from one of Bob Shea’s newest picture books, Dinosaur vs. the Library (Hyperion, September 2011); the cover and more images are below, as well as images from another of his new titles, which I haven’t seen yet but hope to today, called I’m a Shark (Balzer + Bray, May 2011). 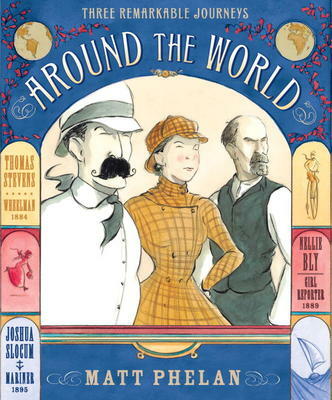 And below Bob’s dinosaur up there is an image from the Nellie-Bly portion of Matt Phelan’s newest graphic novel, called Around the World, published by Candlewick this month. I’ve got more art below from that as well. 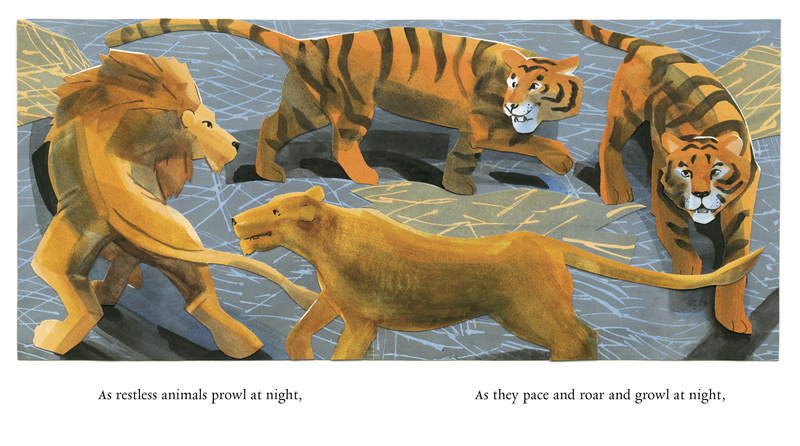 This morning over at Kirkus, I take a look at the new picture book from master author/illustrator Eric Carle. The link is here.